Are you heading a start-up with the potential to grow significantly? 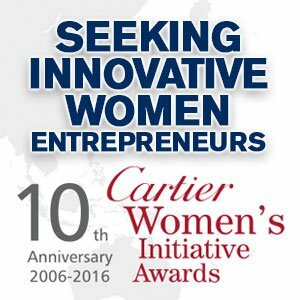 Now’s the time to apply for the 2016 Cartier Women’s Initiative Awards. This international business plan competition — created by Cartier, the Women’s Forum, McKinsey & Company and INSEAD business school — identifies and encourages projects by women entrepreneurs. Laureates receive a comprehensive support package, including $20,000 in funding, one year of coaching, networking opportunities, and media exposure.